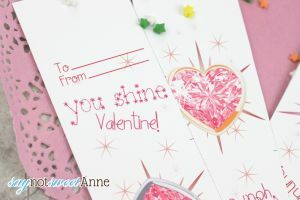 I know this time of year we are all flooded with cutesy printables and paper valentines. There are punny ones, monster ones, easy ones and hard ones. I almost hate to add to the overload, but I made these printable valentines to be a little different. 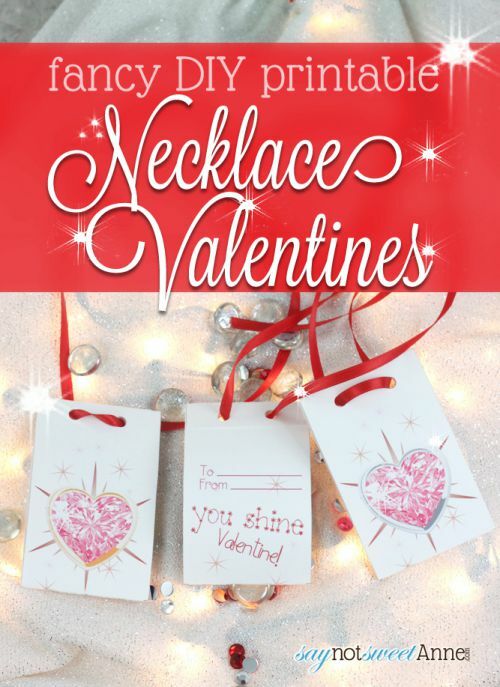 You see, these printable valentines are meant to become necklaces. In my experience, anything with sparkles on it that you can wear is a special treat (hint – hint- hubby.) So, in true “diamonds are a girl’s best friend” fashion, I’ve created these! I’m a huge fan of versatility and a surprise use. Not only can you put whatever candy you want in these wrappers (since its the illustration on the front that completes the pun, not the candy) you can give them away with or without strings! If you string them, I’m sure you’ll find a classroom full of princess divas wearing their jewels! Did I mention they are so easy? The valentines are just strips of paper, folded and secured at the top. 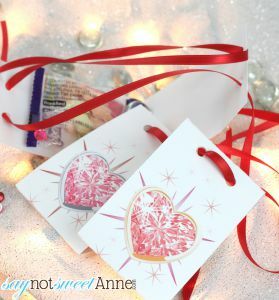 A little double sided tape, candy and string and voila! A Necklace valentine. So, what are you waiting for? Download the PDF! These are too cute, Kayla! I love that you can stuff them with candy! WIN! Since, we are snowed in and get to store to pick up Valentine’s Day gifts, we are going to put this printable to good use. The kids will love it. Thanks for sharing! Stopping by from SITS. How adorable. Love the talent behind the idea. Visiting from #SITSBlogging love. These are really cute, good for the big and little girls in our lives! Just sharing comment love from Sits! [email protected] recently posted..Oh Hearts of Mine!